But they welcomed the Judge rejecting a number of the oil company’s restrictions. The Judge rejected UKOG’s inclusion of their offices in Guildford as part of the injunction. He accepted Friends of the Earth’s case and disallowed a blanket ban on publicising and promoting protest activities. The Judge also removed some of the most restrictive clauses – like the attempt to stop monitoring what goes on at the sites. The Judgement does however ban some protest activities which affect UKOG’s commercial interests at Horse Hill in Surrey and Broadford Bridge in West Sussex, which have been prioritised over the communities’ legitimate opposition and concerns about the adverse environmental impact of UKOG’s activities. 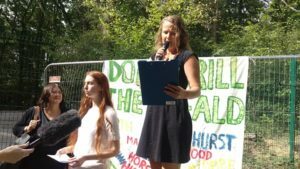 A statement on behalf of the defendants from the Weald Action Group, said: “It was worth fighting this draconian injunction. If we hadn’t done so when it first appeared in March, UK Oil and Gas might have succeeded in its attempt to ban lawful protest in an injunction which then covered four sites at its Headquarters and Markwells Wood. The Judge has drawn an important line in the sand on some issues, like the right to publicise and support protests and the right to monitor what goes on at the sites. He also limited UKOG’s attempt to curtail free speech by rejecting UKOG’s claim to restrict communications with the company and its supply chain. UKOG also abandoned their attempt to ban direct action as unlawful. “UKOG have ended up with an injunction at two sites which restricts significantly less than they sought. This is a partial success. But the injunction is still against persons unknown – which means everyone potentially. The injunction as it stands leaves considerable uncertainty as to what is and isn’t allowed and that is one of the things that are seriously wrong with it. It is unclear and complex and will continue to deter participation in entirely lawful and peaceful campaigning . The defendants are considering applying to appeal against the ruling, which is part of a trend of court decisions targeted at silencing the growing dissent against fracking and other forms of onshore oil and gas exploration. Sites across the South East are being developed by UKOG as part of their aim to get “back to back wells in an industrial production”. This has prompted concerns about the contribution of onshore oil to catastrophic climate change, impacts on drinking water and air pollution, and HGV and other heavy traffic movements on narrow country lanes. The Weald Action Group supports local communities facing threats from this expansion.